John Stallworth is standing in one of his least favorite places, the glow of a spotlight. In a light-blue button-down shirt and dress slacks, he is behind a lectern in a concert hall in his home of Huntsville, Ala., introducing the third annual John Stallworth Legends Round Table, an event he created to inspire and influence young athletes and students. “Regardless of what you think of us when you look at us in the light of our success, we want you to realize your journey is not terribly different from ours,” says Stallworth, 62, moderating a panel that includes former Steelers teammate Franco Harris, ex-­Seahawks receiver Steve Largent and Huntsville’s Margaret Hoelzer, a three-time swimming medalist in the 2008 Olympics. “What you’re going through, we went through those things,” he says. Stallworth is being generous, since it’s unlikely any of the kids in the crowd went through what he did or will reach the same heights. The son of a plumber (David) and a housekeeper (Mary), Stallworth grew up in Tuscaloosa, and at age eight contracted a viral infection that left him temporarily paralyzed on one side. Even after he recovered, he was a clumsy, pigeon-toed kid who’d literally trip over his own feet. Yet, he became a Hall of Fame wide receiver, played in four Super Bowls, and after retiring from football in 1988 developed a multimillion-dollar company and became a part-owner of the very team for which he played 14 NFL seasons. ​Stallworth says his childhood illness “brought out a motivation in me to really extend myself.” He didn’t play organized football until his sophomore year of high school, enrolling at Tuscaloosa High after being told by a coach he was too small to play for the predominantly black Druid City High, a football power. He became an All-Star running back but was virtually unnoticed by colleges, particularly in-state powers Alabama and Auburn. The Rev. Sylvester Croom Sr., a family friend whose son Sylvester Jr. would play at Alabama and enjoy a long coaching career (he’s currently running backs coach for the Titans), recommended Stallworth to his alma mater, Alabama A&M in Huntsville. Once he arrived on the Normal, Ala., campus, Stallworth transitioned to wide receiver and became a two-time all-conference selection and the alltime leading receiver in school history. Veteran Steelers scout Bill Nunn urged Pittsburgh to draft him; the Steelers made Stallworth a fourth-round pick in 1974, joining future Hall of Famers Lynn Swann (first), Jack Lambert (second) and Mike Webster (fifth) in arguably the best single-year draft haul ever. Swann, out of USC, was the glamor pick, worthy of a 267-word bio in the Steelers’ ‘74 media guide. Stallworth’s story was told in just 60. Stallworth earned his MBA while setting Steelers records for receptions and yards. ​“He was an unassuming guy who didn’t come in with much fanfare,” Harris says, “but you noticed that he steadily kept working hard, pounding away. Before you knew it you said, This guy is good. This guy has talent. 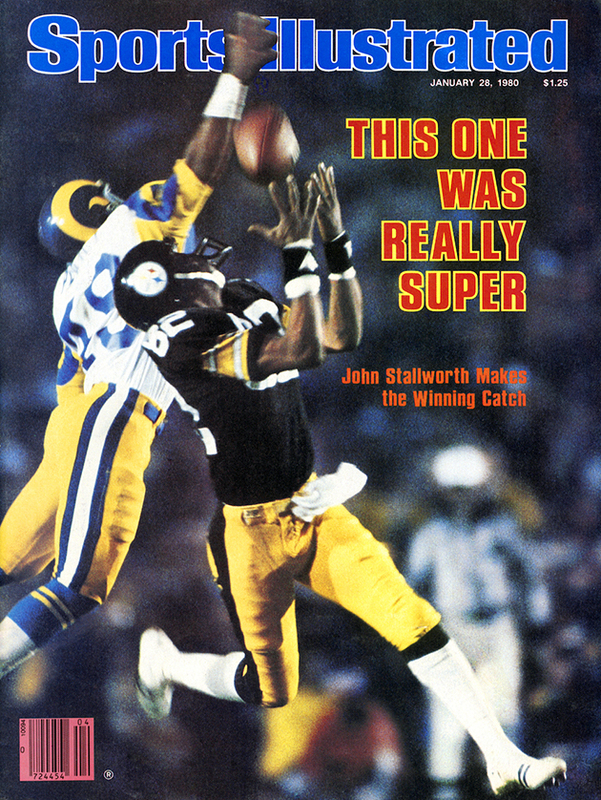 He just grew into greatness.” Stallworth was twice the Steelers’ MVP and still owns Super Bowl records for most yards per catch in a single game (40.3) and career (24.4). He had two touchdown receptions in Super Bowl XIII, a 35­31 win over the Cowboys, and his fourth-quarter, 73-yard TD the following year put the Steelers ahead for good in a 31­19 win over the Rams. “I made up my mind I was not going to play and make a little money and then wonder what happened to it,” Stallworth says. Armed with his business degree from Alabama A&M, he returned each off-season to Huntsville, where his wife, Flo, son John Jr. and daughter Natasha lived year-round, and “experimented,” earning licenses to sell insurance and real estate and developing apartment complexes while earning his MBA. ​Along the way Stallworth met Sam Hazelrig, a retired engineer, through their kids’ soccer league. They talked about the burgeoning defense and missile industry in Huntsville, and in 1986, the year before he retired from the Steelers, they created Madison Research Corporation, which provided services, made parts and developed software for the government. Working out of Stallworth’s home and typing proposals on an electric typewriter with an out-of-whack T key, Madison Research earned its first small contract with the Anniston Army Depot for two pieces of hardware for an M1 tank in 1987, then gradually blossomed. By 2006, Madison Research had 375 employees in 15 states. A company that started with a faulty typewriter had come to manage computer maintenance at the Space and Missile Defense Command’s Simulation Center in Huntsville. That year Stallworth sold the business for $69 million. He also joined with Bobby Bradley, a family friend and the founder of Computer Systems Technology, to form Genesis II, a holding company that would control their investments, business development plans and charity work. For Stallworth that meant focusing on the John Stallworth Foundation, which has sponsored the Round Table since 2012 and, since ‘02, a celebrity golf tournament in Huntsville attended by former Steelers such as Harris, Swann, Mel Blount, Donnie Shell and the Dolphins’ Dwight Stephenson. 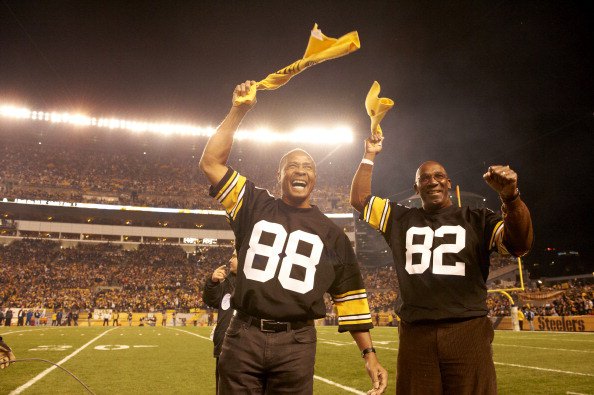 Stallworth and Swann, who were both drafted by Pittsburgh in 1974, led the crowd in a Terrible Towel wave in a 2012 game.